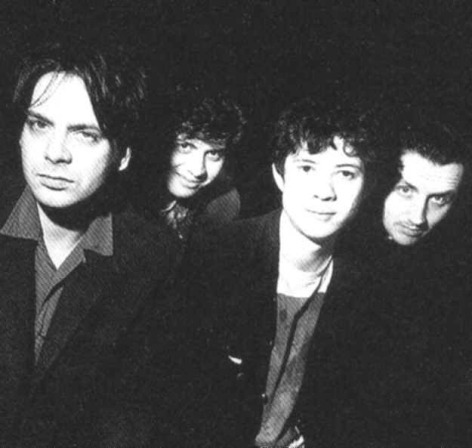 That said, Moose had already moved away from their shoegazing roots by the time they cut their debut album ...XYZ and turned to a more jangly, poppier sound. However, there was still a definite emphasis on their sleepy vocals and that wall-of-sound style, so perhaps it was just a half-turn in a different (and better!) direction. The one thing I like most about Moose is their ability to write songs that are undeniably happy but with a dash of bittersweet, which gives them just the right sort of tang. Take “Little Bird (Are You Happy in Your Cage? ),” which is an upbeat tune with a cute melody, but there's a touch of melancholy lurking in those backup vocals and strings. It's also pretty clear these guys had some of the best instrumentation abilities of anyone in the business. “Don't Bring Me Down” would have worked great as an ordinary country-folk song with a decent melody, but instead of the usual country-folk instrumentation, they orchestrated it with a mildly chugging fuzz guitar along with a whole litter of subtly noodling guitars. That creates an inventive and richly absorbing texture. “I'll See You In My Dreams” is another one of my favorites; it's a sparkly but dense French-pop waltz with instrumentation so unusual that it sounds like it's made out of liquid. They also did a brilliant job covering Harry Nilsson's beautiful tune “Everybody's Talking,” giving it their signature jangly, dreamy treatment to give it a rather different feel. My one complaint about their orchestration is that sometimes they go a little too far with their chaotic tendencies. Notably, “The Whistling Song” has so much going on that it's very difficult for me to have fun with it. Although for the most part, I still enjoy that song. ...I enjoy everything on ...XYZ. I might have to backpedal some of my glowing sentiments about this album, since I don't think every joe schmoe on the planet is going to connect with Moose and their dreamy (and occasionally dreary and cluttered) atmospheres. Even some of the songs I really liked in this, many people are going to think is over-the-top. (For me, trying to pick out all the sounds they put in these songs gives it more replay value.) So do exercise some caution before blindly purchasing this album on my recommendation—definitely take a few listens to songs posted on YouTube or samples from Amazon to see if it's your cup of tea. However, it's safe to say that anybody who loves this sort of dreamy British underground music from the early '90s needs to take a look. This is one very solid album, and after you take a listen to it, you'll probably do what I did and wonder why these guys aren't more well-known. The people in charge of the reissuing of this album were kind enough to include the entire EP Sonny and Sam as bonus tracks. As it turns out, Sonny and Sam was actually a compilation of songs from Moose's earliest three EPs. (There were five other songs from those EPs that aren't included in this release, but I reviewed those anyway!) As I indicated earlier, the songs in the bonus tracks are thought to have defined shoegazing, so they're not as jangly nor as warmly melodic as the material from the main album. But for my money, they are just as absorbing. My favorite is the utterly menacing and mesmerizing “Suzanne” with just about the weirdest drum and guitar pattern that I've ever heard. Although I suppose other people might enjoy the more straightforward and catchier “Jack,” or perhaps even the eight-minute-long space-rock instrumental “Do You Remember?” And you know what? All these songs are excellent, so whatever you personally like best is fine with me. 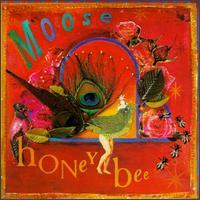 Like the previous album, Moose aimed to put a new spin on '60s music, but they gave it such a heavy spin in Honey Bee that it started to get dizzying. Upon first listen, this is a mess of an album where the background instrumentals frequently come across as complicated and noisy, and they have a tendency to overshadow Russell Yates' drowsy singing style. That proved catastrophic for the first time I listened to this; not only was I not able to get into it at all, but I found it to be a rather unpleasant experience. However, once I dared to sit back and give this thing half a chance, my brain eventually sorted out all the dizziness, and I discovered that this album wasn't unpleasant at all but quite the opposite. The reason it sounds so messier than ...XYZ might not have been intentional at all. The story is that ...XYZ sold so poorly, that the band lost quite a bit their budget to produce this follow-up. That would certainly explain the rawer and chunkier sound of these instrumentals. They apparently couldn't even afford to put a nice reverb effect on Yate's vocals, which—let's face it—helps smooth him out to his benefit. There's no question that Yates is able to hold onto a note, and he comes across as a friendly and warm singer, but his vocals just don't seem to take command over these songs like they do in other Moose records. However, why would you care so much about the song production when the actual songwriting is just as impressive as it ever was on ...XYZ. The opener, “Uptown Invisible,” is one of the album's most memorable songs, which is characterized by its rather heavy, tribal-esque drumbeat that runs rampant throughout. The beat seems kind of overbearing, but underneath it, you can hear a tranquil watery guitars and somebody going really nuts with a flute. It's unlike anything I've heard before, and it's undeniably cool from beginning to end. The song also has a tendency to get busier towards the end (right about when you're asking yourself “how can it get busier?”), and somehow I seem to get even more caught up into it as they continue to layer more guitars and more vocals. It gets so lush by the end that they even get some female back-up singers to start doing some heavy vocal harmonization that sounds right out of an old Association hit. Unfortunately, not every song on this album manages to deal with its mess quite as successfully as “Uptown Invisible.” The complicated rhythm they concoct for “Meringue” flows rather awfully, and it doesn't seem to connect at all with Yates' lethargic singing. “You Don't Listen” is entirely pleasant, but it wallows around too much in its hazy daze that it's never allowed to catch fire. “Asleep at the Wheel” features a very lengthy fade-in and fade-out, which leaves the otherwise summery and tranquil song feeling only half-written. But those are just a few nitpicks I have, and they're very minor ones. Surely, the huge highlights this album has to offer more than make up for them. When they do a song like the lush mid-tempo pop song “Mondo Crane,” the melancholic “Joe Courtesy,” and the bright and riffy “I Wanted to See If I Want You” my eyes really brighten up! Have I mentioned before that this sunshine jangly stuff is one of my favorite kinds of music? My eyes are brightening up quite a bit! By far my favorite song of the album is “Dress You The Same.” Stylistically, it is exactly like these other songs; the instrumentation is so unkempt and jangly that seems to overshadow Yates' drowsy singing style. However, the atmosphere is so calm and inviting, and—most importantly—its melody is just so engaging that I can consider it nothing less than a brilliant masterpiece. Even at this album's messiest, there always seems to be some sort of jangly '60s pop tune lying underneath, but sometimes it has trouble making it out of all the overgrown weeds. Without a doubt, this album have sounded better had Moose had done a little more post-production on this. That said, I can sit here wishing for better production all day, and that would not make it happen, so there's no point dwelling on it. With or without better production, this is an excellent jangle-pop record from the '90s, and if you enjoyed Moose's debut album, then there shouldn't be anything to stop you from picking up this follow up. I “only” gave it an 11, but it's on the upper range of that. Much of what I was complaining about throughout my Honey Bee review has been addressed and fixed, and that has made me happier than a wooden spoon at a spelling bee. The first three songs are so brilliant, so well-produced, and so tuneful that they're like golden rays of sunshine that are beaming right out of my speakers. Don't believe me? Take a listen to these songs for yourself. The album opens with the jangly, lush, and sunny “Play God.” That is the sort of song that I listen to only once, and it has me hooked for life. It consists of a quickly strummed acoustic guitar, and it is accompanied by sprightly and bubbly bongo drums. The elaborate and evolving string section in the background puts some glory in it, and watery guitar embellishments throughout gives it personality. Some people might take a listen to it and think that they put waaay too much stuff in there—that it's too busy and filled with extraneous notes. But no, these people would be dead wrong. This instrumentation style is like fireworks for my ears. I'm guessing “Play God” was designed to be the hit single of the album since nothing else on the album sounds quite so *sparkly* and *glistening*. In theory, that was a pretty good strategy; all it takes is one hit single to be put on the map, and “Play God” was their best candidate. Unfortunately for Moose, the universe was a cruel and stupid place in the mid '90s (i.e. “Ironic” by Alanis Morissette), and the listening public didn't give a damn about that song. But you, who are reading this sentence, can correct this grave injustice by listening to the song right now. You'll be glad that you did. I spent two paragraphs talking about only one song, but don't let that fool you into thinking that's all this album has to offer. Rest assured, there are plenty of other good jingles here! “The Man Who Hanged Himself” might have a depressing title, but the sound of it is happy and upbeat. You can even hear some gleeful whistling at the beginning of it! It has a thickly produced and lush atmosphere, a melody that's almost effortlessly hooky, and a Burt Bacharach style trumpet part in the middle. It's a pure win from beginning to end. “The First Balloon to Nice” is possibly the most breezy and pleasant song in existence. It puts me right there up in the blue skies, wafting along the French countryside in the cool air. You might be reading that as sarcasm, but don't. That is without a doubt one of the most feel-good songs that I've ever listened to. They slow things down unfortunately by the midsection where the songs start to get drearier and less stimulating. The first half of “Rubdown” is a nearly miserable instrumental consisting mostly of a low-key, two-chord electric organ loop. Perhaps it was supposed to be experimental. Unfortunately, it wasn't a success. “Poor Man” is much more pleasant, but it doesn't seem to be able or willing to get itself out of its wallowing and low-key texture. I have a similar complaint about “Eve in a Dream” and “Old Man Time” except the textures are far less dreary and thus more likable. 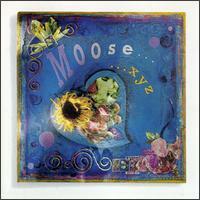 I'm still horrified that a band as good as Moose wasn't more well-loved by the masses. I mean, I'd much more willingly listen to this album than, say, Automatic For the People. That's just my personal preference, I guess. Even though Live a Little Love a Lot is far from a perfect album, it makes a great listen. You'll like it because the melodies are catchy, the atmosphere is happy, and Russell Yates' distinctly deep, dark and friendly vocals never sounded purer. Here is the 11th Commandment: Thou shall give this album a whirl. Moose's final album was their magnum opus, and it blows everything they did previously right out of the water; it's even better than ...XYZ, which I adored so much that my head nearly popped off my neck as I was writing the review. This album was recorded in 1996 and 1997, but it wasn't until 2000 when it saw the light of day. God knows why they waited so long to release it; if I made an album like this, I would have been itching to get it released as soon as possible. According to my reliable Internet sources, Moose delayed this release because they were deciding how, or if, they were going to continue to go on. Much to my dismay, they had already called it quits when this was released. This is a significant departure from their previous albums, which might come to some as a shock. However, as evidenced by that 14-rating, I would hope it would be a pleasant shock for everyone. Of course they're still writing '60s pop inspired music, but instead of concentrating on jangly, acoustic-led numbers, they are far more atmosphere-oriented. Moose create synthscapes so elaborate and rich that I suspect Brian Eno would approve. Plus, their arrangement capabilities are sometimes strange but always satisfying. Many of these songs are embellished by zippy xylophones, twangy spaghetti-western guitar, scaling strings, bubbly pizzicato strings, sprightly harpsichords, weird voice synthesizers, and best of all a lot of watery guitar. Sometimes the watery guitar comes out to play for a full-on solo, but most often, you'll hear it lumbering around in the background, creating fireworks. I could compare this album to Coldplay (even though their debut album was released some time after this); that would be easy for me since that's the band I compared this to when I first reviewed this in 2005, and the comparison always stuck with me. 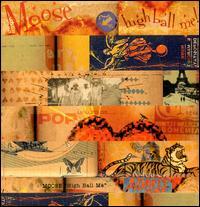 Like most Coldplay music, Moose write songs that are smooth, thickly produced, and lush. However, the fundamental difference between them were their attitudes; Coldplay was grim, and Moose wanted to put a smile on your face. Yessiree, this is happy music, and they achieve it without ever sounding corny or like they overdosed on Prozac. Plus, I much prefer Russell Yates' deep, sleepy vocal style to Chris Martin's awkward, regular-man vocals. Shouldn't we all? But the world is unfair. Nobody would buy this album, and everybody buys Coldplay albums. Life is a gyp. This was my first exposure to Moose, and I was floored the first time I heard it. It wasn't just because I thought it was happy and the atmospheres were well-developed, but I found these melodies to be immensely catchy. 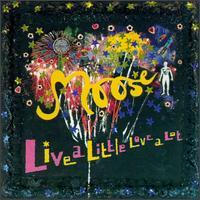 Of course catchy melodies are something that Moose were always good for, but never quite at this level. Take a listen to “The Only Man in Town” and see if you can resist getting its sweet vocal melody caught in your head. I'd imagine you'll also just as eagerly recall the counter melody in the chorus, which carried out with a bright, wafting violin line. That's my favorite song of the album. But this is such a strong album that I could imagine someone else preferring another one of these songs. Those who like French-pop inspired music might enjoy the laid-back and insanely catchy “Lily La Tigresse.” Another favorite is the zippy and cheeky “Keeping Up With You,” which is the song with the twangy spaghetti western guitar. The near-instrumental “Won't Look For Love” is one of the most engaging and entertaining songs of its kind; it's quite similar to Duran Duran's “Tel Aviv,” except it's cheerier. It sounds a bit plasticized, like elevator music, but that helps it achieve a strange and extra-cheeky vibe. The closest thing they have on this record to their more familiar jangle-pop sound is “There's a Place” where the strummy acoustic guitar provides the basis of the atmosphere. While it might not be the most compelling song of the bunch, I still have to love it, because the chorus just soooaaars. I haven't mentioned every song in this review, but I wish I did; there isn't a single song here that fails to have a good, and usually whistleable tune. I really don't know what the hell is wrong with this world. Bands like Coldplay and Radiohead write these sad and depressing songs, and they become megastars. Moose writes similar songs except they're happy, but they're among the most obscure bands that I've ever reviewed. Why must we all be so obsessed with misery? The time has come, folks, for you to stop slitting your wrists and get out the music that aims to make your world a better place. If not Moose, then … Stevie Wonder. But seriously, ya gotta give this album a quick listen at least once in your life; it's one of my all-time favorites.